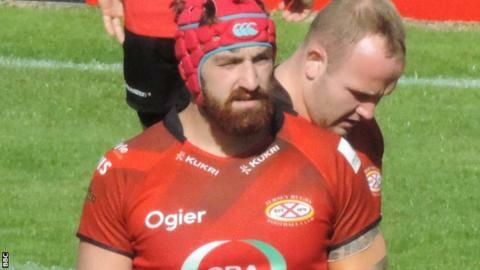 Jersey got back to winning ways and prolonged the miserable form of London Scottish in Richmond. The islanders were ahead inside five minutes when wing Ross Adair touched down in the corner after a good burst from flanker Gary Graham. Matt Williams went over for the hosts at the other end, chasing onto his own kick, to narrow the gap. Graham crashed over from a rolling maul to help extend the Jersey advantage to a match-winning 20-5 by half-time. Neither side troubled the scorers in the second half. The Exiles have now lost four in-a-row and remain seventh in the Championship, while the Channel Islanders pull level on points with their opponents, and move into eighth spot above London Welsh. London Scottish: Lydon; Williams, Locke, Harries, Marchant; Grove, Heeks; Hallam, Kwasnicki, Shields, Patrick, Brown, Clarke, Pennycook, Bright (capt). Replacements: Cherry, Gibbons, Litchfield, Treadwell, Bartle, Calder, Jackson. Jersey: Penberthy; Howe, Otto, Robling, Adair; Cope, Fisilau; Lockwood, Garcia-Veiga, Herriott, McKern, Phillips, Rae (capt), Graham, Haining. Replacements: Selway, Lancuba, Tomaszczyk, Kolo'ofa'i, Freeman, Moates, McCrea.